This panna cotta is probably one of the easiest things I’ve learned to make so far in school. I sorta missed that the chef told us to make a half recipe which meant I wound up with twice as much as I should have. Woops! Not such a bad thing though – we’ve been enjoying this all weekend. Since I had so much leftover, today I decided to dress it up with a raspberry coulis. PS, don’t throw away the leftover raspberry mixture. If you can handle the seeds, there’s plenty leftover to use for a jam on you breakfast bagel or English muffin. I recommend making these in the following order: panna cotta, because it needs the most time to set, then the simple syrup because it needs to be completely cooled before using, and finally the coulis. All of these can be made a day ahead of time should you want something easy and impressive to serve at a dinner party. The flavor is amazing and it’s a surprisingly light dessert despite being composed of some heavy ingredients. Makes 6 3 to 4 oz servings; more or less depending on the size of the mold you use. *You can use gelatin. For a softer texture and if you’re going to be serving this in the dish it sets in, use 1½ tsps. For a firmer dessert and if you will be taking it out of the mold for plating, use 2 ¼ tsp. Heat the milk, cream and sugar in a sauce pan until the sugar is dissolved and a light film appears on top of the liquid and there are small bubbles along the side of the pan. While the milk, cream and sugar are heating, combine the 4 tbsp water and agar and bring to a boil. Don’t skip this step, the agar has to come to a boil before being put into the mixture. Pour mixture into molds and chill until set, about 6 hours. Bring the raspberries, syrup, and lemon juice to a simmer in a heavy medium saucepan over low heat. Simmer, stirring occasionally, until the berries are very soft, about 8 minutes. Sprinkle the cornstarch over 2 teaspoons cold water and stir to dissolve. Pour into the simmering raspberry mixture. Cook, stirring occasionally, until the sauce thickens, about 3 minutes. Strain through a fine-mesh sieve into a bowl; discard the seeds. Cool completely, then cover and refrigerate until ready to use. Freeze any leftover coulis in a plastic container for up to 1 month. Combine ½ cup water and ½ cup sugar in a small saucepan and bring to a boil over high heat. Reduce the heat to medium-low and simmer, stirring occasionally, until the sugar dissolves, about 3 minutes. Pour the syrup into a container and refrigerate until completely cold, about 45 minutes. The syrup can be stored in an air-tight container in the refrigerator for up to 1 week. 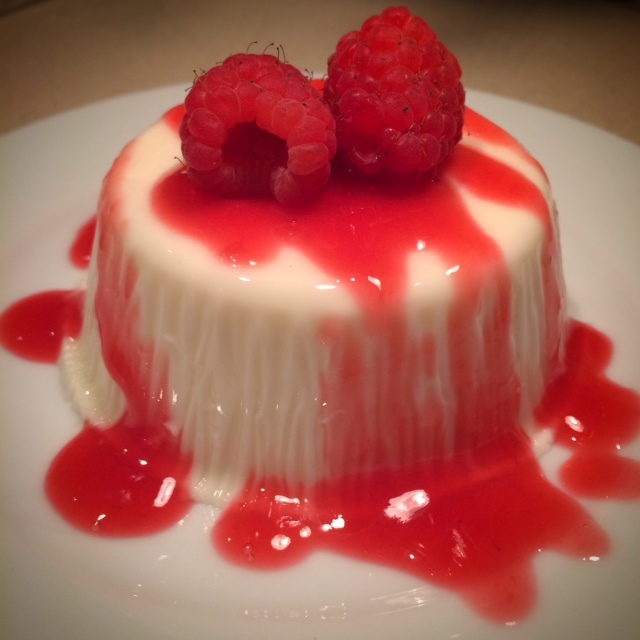 Plate the panna cotta and drizzle with the raspberry coulis. Garnish with one or two whole raspberries and mint (optional).